Unknown underground conditions can lead to project risk and uncertainty. We’ll determine the ground conditions at your site and how they will impact your project. We have experience assessing all types of subsurface materials and conditions, and how to address them for your project. With in-depth analyses of the soil and rock properties on site, our engineers help you proceed to build successfully – from initial concept through construction. 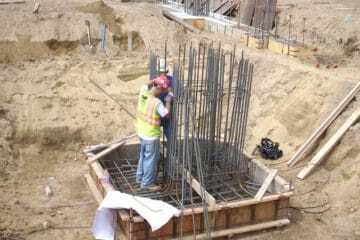 Our projects include geotechnical analysis and design for building foundations, transportation infrastructure improvements, and utility layouts. Our experts work with highly technical designs in challenging conditions including infrastructure over water or undeveloped land; developments in heavily dense urban areas; energy infrastructure; and projects around railways or highways. Our team balances risk and foundation costs to optimize the best solution for our clients. We incorporate sustainable practices whenever possible. We are often able to reduce off-site disposal of urban fill (or other unsuitable soils) by reusing these soils elsewhere on site, or by using one of several potential ground improvement techniques. We also work with environmental teams to secure environmental sampling during geotechnical investigations to minimize truck mobilizations and ground disturbances. These approaches reduce carbon emissions by eliminating the use of excavation and trucking equipment and reducing the use of deep foundation materials.